Anybody Can Be cool-But Awesome Takes Practice is an adventure in letting truth shape one's self-image. Discover what God says about each one of them. Focus on biblical truths that free people to express their true personalities. Be strong to stand up to the constant lies from Satan regarding inferiority, lack of self-acceptance and peer pressure. 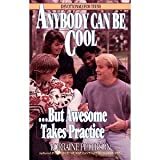 "Anybody Can Be Cool-- But Awesome Takes Practice"
Here is a book from the 80s which reminds us of one of life's essential truths. One of the many cheesy "devotionals." I would love to have this on my shelf, if only for the title of the book. This book is for REAL and it helps teens: Discover what God says about each one of them, Be strong to stand up to the constant lies from Satan regarding inferiority, lack of self-acceptance and peer pressure, Become the unique and beautifully designed person God has created to reflect Jesus Christ to the world.